I have been working with children for the past nine years. I spent four years coaching at a children sports camp and I nannied through college. 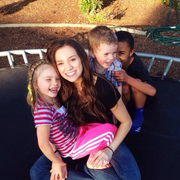 (Children ages ranging from 8 months to 14 years old) Whether it has been full time nannying, coaching, or occasional babysitting, I have absolutely loved my experience working with children. About me: I graduated from San Jose State University in 2017 and currently work in marketing. I am very passionate about living a healthy and active lifestyle and love being outdoors. I can help out around the house (cook, clean, drive, run errands, help with homework, etc) and I am CPR/first aid certified with a reliable car.